Theresa is my 2nd great aunt; she is one of eleven children born to Richard Scott and Ann Jane Tinsley. The Scott families were well respected farmers in Stoneyford, Co. Antrim, where I’ve traced them back to the late 1700’s. 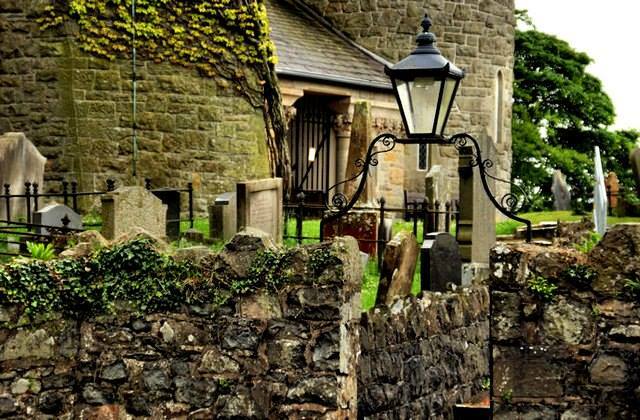 If you have researched Ireland then you are aware that it becomes very difficult to trace lineage prior to that; other than “hanging out in cemeteries” and delving into Church records; it is almost impossible. Although I have many conflicting records for Theresa’s birth it would seem she was born early in the year 1838. Records from the Derriaghy Church of Ireland show that she was baptized March 25, 1838. 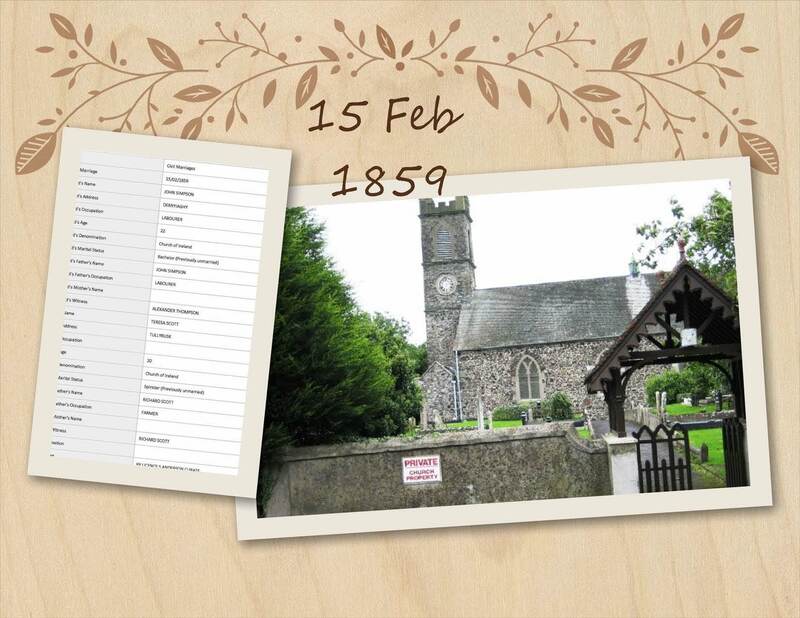 On 15 Feb 1859 Theresa was married to John Simpson by S. Anderson, Curate of St. Aiden’s Parish Church. Their wedding was witnessed by Richard Scott, her brother and my 2nd great grandfather; and Alexander Thompson, who I believe was one of her cousins. More research is required to confirm this supposition. 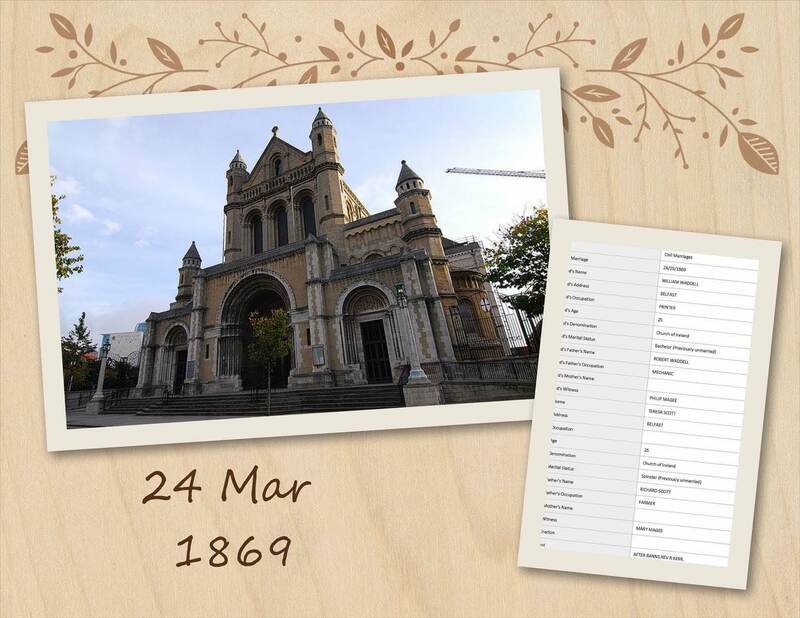 Theresa and John had one son, John Edward; who was baptized at St. Anne’s Cathedral in the Shankill, Belfast, on 23 Nov 1859. Family lore would suggest that Theresa and John never “took up house together”; which might intimate a “shot gun wedding”! Very shortly after John Edward’s birth his father went to America – never to return, leaving Theresa to raise her son alone. Seemingly, Theresa moved on with her life and remarried on 24 Mar 1869. She married William Waddell, son of Robert; in St. Anne’s Church of Ireland by Rev. R. Kerr. Philip and Mary Magee, her sister and brother in law; witnessed their wedding. It would seem that lengthy marriages for Theresa where not to be; William passed away on 1 Oct 1881. Once again, Theresa was alone. Her son, John Edward had emigrated to Chicago, Illinois, USA in 1880 with two of his cousins, Richard Dawson and Richard MaGee. They had lived on neighbouring farms “back home”. The disease that Theresa spoke of was the “fever” in this case small pox, infesting Belfast in the 1870’s & 1880’s and returning in February of 1891. On 21 Feb 1892 Theresa passed away in her home in the presence of her son, John Edward. Her death record shows cause of death as “Cancer of the Uterus; 8 months certified”. The record also shows that she was the widow of William Waddell, Printer and she was 44 at the time of her death. 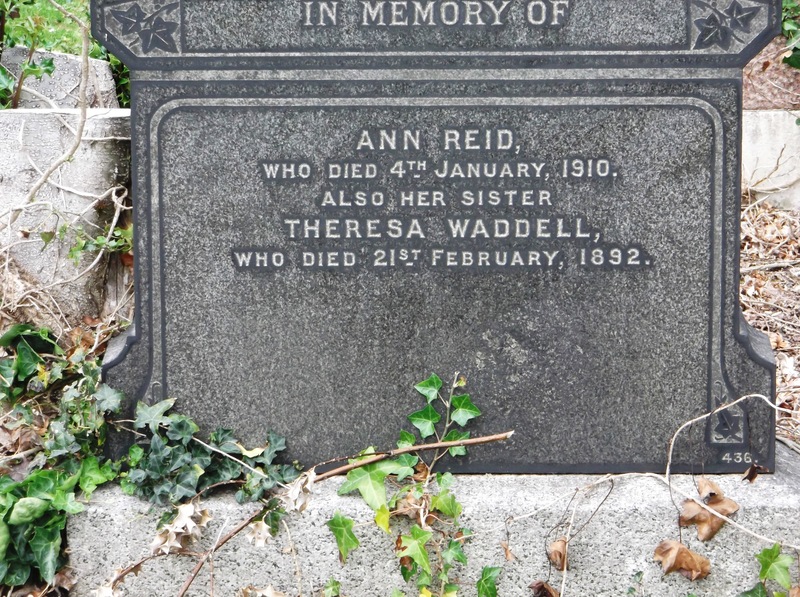 She is interred in the Belfast City Cemetery with her husband, William; her sister Ann Reid (nee Scott); and an infant by the name of William John McKnight, another family member. 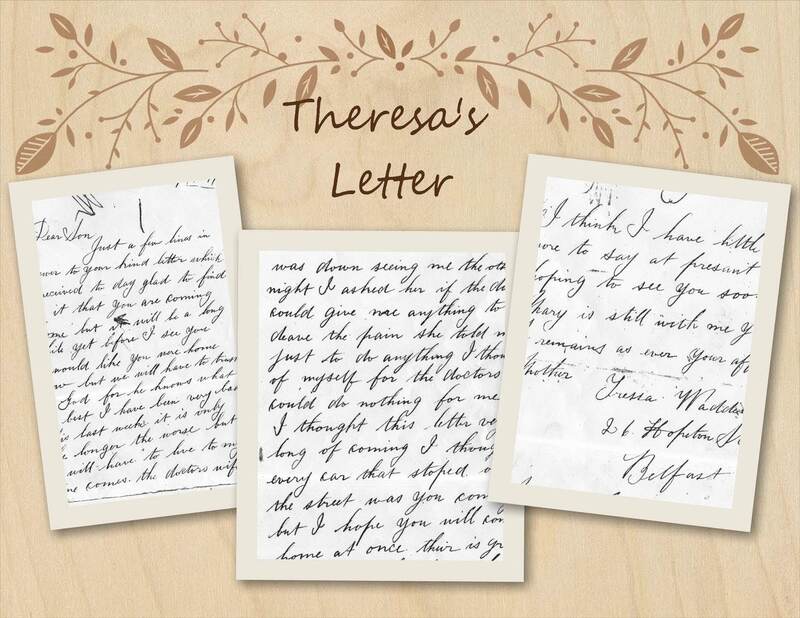 Each time I read Theresa’s letter to John Edward I am overcome with sadness and a hope that she is now at peace. Copyright (c) (2014) (https://twistedlimbsandcrookedbranches.com). All Rights Reserved. This entry was posted in Belfast, Burial Records, Co. Antrim, Family History, Geneaology, Ireland and tagged Belfast, Belfast City Cemetery, Co. Antrim, Derriaghy Church of Ireland, Family History, Geneaology, Glenavy, Scott Family, Simpson; Waddell, St. Aiden’s Parish Church, St. Anne's Cathedral - Shankill, Stoneyford. Bookmark the permalink. What was the issue to records prior to the 1700s? I know our family tree seems to stop at 1765 in Ireland and I would love to know further back some day. Have the records disappeared or never existed? 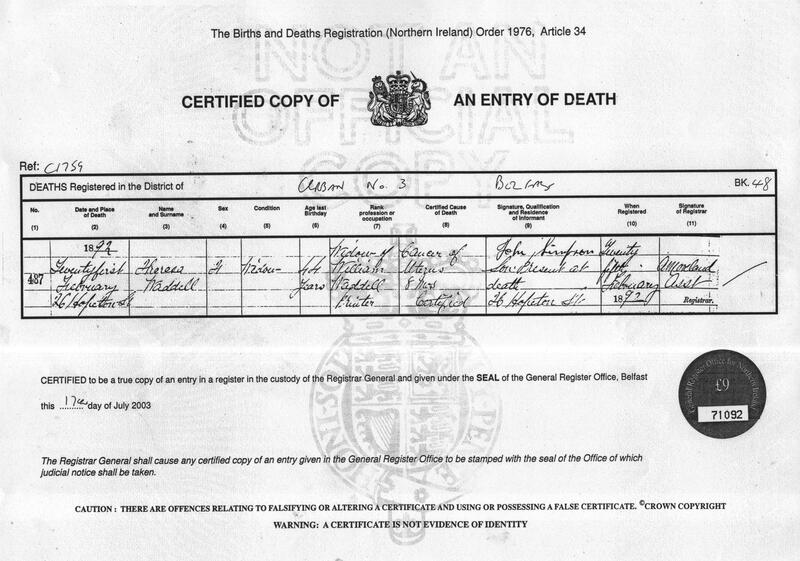 Some of the stories behind the birth, marriage and death certificates are indeed quite sad. You’ve done a beautiful job of presenting Theresa’s story.